So, if you're joining us after reading our previous article which was all about SEER (Seasonal Energy Efficiency Ratio), then EER (Energy Efficiency Ratio) will be much easier to understand (because you already do! ), and if you haven't read our article where we explain what SEER is, then we highly recommend it, as it will make understanding EER much easier. Question: Since modern air conditioners all use electrical energy to transfer heat from area to another, have you ever wondered how much electrical energy it takes for your air conditioner to transfer a specific amount of heat when the temperature is say, 95°F outside and 80°F inside your house? The Energy Efficiency Ratio (EER) is an efficiency rating that is used to express how much cooling capacity an air conditioner provides given a specific amount of electrical energy input, or vice versa - It's a simple energy input vs energy output efficiency rating which can be used to help us answer the question above. EER can be used to tell us how many BTUs of cooling output an air conditioner will provide after using 5000 Watt Hours worth of energy, or how much energy an air conditioner will consume when transfering 60,000 BTUs of heat. "Wait a minute.. Doesn't EER only apply to those small window air conditioners?" Traditionally EER labels were only found on smaller, single room/portable air conditioners, or window units, but recent changes to energy efficiency laws has made EER take on an important role for central air conditioning systems as well. In 2015, the DOE (Department on Energy) confirmed that HVAC efficiency standards will now begin to vary by region of the United States, which included defining a minimum central air conditioning system EER for warmer climates. This meant that, no longer was there a single efficiency rating for the entire US. Instead, efficiency standards began to be separated by climate, and therefore depending on which state within the US air conditioning or heat pump equipment was to be installed and operated within determined the minimum efficiency requirements for that equipment. 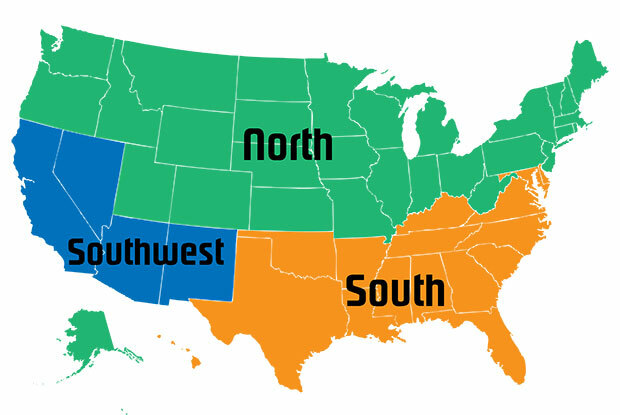 Currently the Southwestern region of the United States is the only region that requires a minimum EER efficiency rating for residential split system air conditioning and heat pump equipment, this region, as defined by the DOE, includes the following states: Arizona, Nevada, California, and New Mexico. It's important to note that, even though most states don't have a minimum EER requirement, this does not mean EER is not evaluated or published data that is readily available to the public, right now. Infact, EER is evaluated in order to determine SEER, that is to say, there can be no SEER without an EER - SEER is actually based off several EER calculations. Therefore, if a system has a SEER, we can look up it's EER through the AHRI's (Air Conditioning, Heating, and Refrigeration Institute) Performance Directory even if there is no minimum EER requirement in your state. "So why now? Why require 2 efficiency ratings for one area?" Simply put: Because temperatures are very high in the Southwest region of the United States, so an efficiency rating that specifically focuses on AC performance within a hot climate makes more sense in these areas. 95°F with a relative humidity of 39%. So if you'll recall from our last article where we discussed SEER, you may remember that SEER was calculated based on an indoor temperature of 80°F, and an outdoor temperature of 82°F. Which means that SEER only describes AC equipment performance in a mild climate, where there is only a 2 degree difference between the indoor and outdoor scenario. Therefore, because SEER is evaluated at a mild set of temperature conditions that the Southwest states only experience a fraction of the time during the entire year, SEER is not as relevant to Southwest energy consumers - It simply doesn't reflect the real climate conditions experienced within warmer states, and therefore doesn't reflect real energy consumption issues warmer states experience, which meant consumers were being mislead by public information. Before 2015, consumers were generally unaware that their equipment even had an EER, because SEER was the only minimum efficiency requirement. Due to this fact, most consumers were basing their AC equipment purchases off SEER labels alone. Little did they know that, just because a piece of AC equipment has a high SEER does not mean that it also has a high EER. Which is to say, just because an air conditioner will perform efficiently in a mild climate, does not mean it will perform efficiently in a hot climate. EER then, makes much more sense to include as an efficiency standard in a hot climate because EER focuses on evaluating AC equipment performance at a higher outdoor temperature, and therefore with a higher temperature difference between the indoor and outdoor environment. Coupled with the combination of the lack of EER public awareness, the lack of EER labeling requirements, and the fact that manufacturers began focusing on producing equipment that only performed best in SEER evaluations, the DOE realized both the public as well as HVAC equipment manufactuers were being led in the wrong direction and energy was not being conserved. Because of this, in 2015 the DOE finally changed their ruling to implementing a minimum EER for states that experienced higher temperatures. The good news is, because the DOE now splits efficiency minimums up by region, the FTC (Federal Trade Commission) has changed it's labeling requirements to begin including EER on the yellow EnergyStar stickers found on HVAC equipment, however, this does not go into full effect until September of 2018. Right now all you may find is a little label on the equipment's data plate that says the equipment meets current standards for the Southwest region, with no indication as to how it meets these requirements or what the EER actually is. The new labeling rule changes all this, and requires a small map that clearly shows which states inside of the US the labeled equipment can be installed within, as well as adding the actual EER to the bottom of the EnergyGuide sticker. As you can see, the SEER is clearly printed on the label at the top, and at the bottom the EER is also listed along with a little map that shows which states the equipment can and cannot be installed within. You also may notice the label also makes a reference to "contractor", and it's clear by reading the FTC's final ruling on HVAC labeling that the FTC is emphasizing the word "contractor" in several ways to consumers by requiring one of several "contractor" phrases to be printed on the label, all of which essentially recommend to the reader that they need to talk to their "contractor" about this label if they are confused. One of the phrases as quoted from the FTC's final ruling paper reads: "This system’s efficiency rating depends on the coil your contractor installs with this unit. The efficiency rating varies slightly in different geographic regions. Ask your contractor for details.". So, it seems the FTC is greatly concerned with public awarness and one of the main hurdles they talked about with the new label is confusing consumers even more than they already are about energy efficiency by listing 2 different energy efficiency ratings on a single piece of equipment, including one that's higher (SEER) than the other (EER). This is obviously going to spawn the question: "Why are there 2 efficiency labels on this air conditioner? Why is one higher than the other? Which one is more important to me?" So, they are expecting contractors to educate the public, which any good contractor should be doing anyway, especially if they want to do the right thing for their customers and actually save them money on their electric bills like so many claim they will do during sales pitches. Manufacturers also now have the option to remove their name from the label, so it's clear that when it comes to consumers experiencing energy consumption issues after the new label that in the eyes of the FTC are no longer recommending that the public should target manufacturers or blame manufacturers for their energy consumption problems, but instead the contractor who installs the equipment, and rightfully so. "So EER minimums are being enforced right now, just not labeled?" Correct - EER may or may not be listed on the equipment yet, manufacturers only have to list if the equipment is or isn't permitted to be installed within the region, without actually labeling the EER data. "So, why the delay? What's the hold up? Print some new labels already!" The issue is due to the politics of the way things are organized: Efficiency standards are regulated by the DOE, but equipment labeleing standards are mandated by the FTC. Because the FTC is a separate entitiy from the DOE, their rules get determined and enforced separately, and as such we have to wait for the new labels to become offcially enforced even though the DOE's minimum requirements are already being enforced. The FTC essentially had to adapt to the DOE's ruling, which meant the FTC had to perform tons of research and hear concerns from state energy representatives, public awareness officials, as well as HVAC equipment manufacturers and a host of other specialists related to the issue at hand, in order to put together the best plan of action for the new labeling requirements so that consumers are no longer mislead, and also so consumers don't get confused when they spot 2 separate efficiency labels on 1 piece of equipment. "EER sounds very similar to SEER. What's the difference? Which is better?" EER stands for Energy Efficiency Ratio, where SEER stands for Seasonal Energy Efficiency Ratio, the difference is: Time. First and foremost, it's best not to look at one or other as better or worse, but instead look at both of these as 2 separate and vaulable perspectives, or tools for which we can use in order to view the whole picture of energy efficiency. Therefore, it's best to know both in order to make a better informed decision between HVAC equipment choices. EER is going to represent how well a piece of equipment operates at a higher temperature, and SEER represents how well a piece of equipment operates over a season when it's cycling on and off and maintaining a small temperature difference. Measures AC performance at a 95°F Outdoor Temperature and 80°F Indoor Temperature. Bases AC performance off a single runtime condition - Does not factor in cycling behavior. Bases AC performance off of the equipment's maximum cooling output capacity. Performance indicates peak demand, with a higher temperature difference between indoor and outdoor environments. Measures AC performance at a 82°F Outdoor Temperature and 80°F Indoor Temperature. Bases performance off a season of runtime - Includes cycling behavior. Bases AC performance off of the equipment's capacity adjusted by the ON/OFF cycling behavior. Performance does not indicate peak demand, with a smaller temperature difference between indoor and outdoor environments. Like SEER testing, EER testing is performed in a laboratory setting (infact, within the same lab and at the same time SEER is evaluated) and within a simulated indoor and outdoor environment, the conditions are just kept constant, and the outdoor temperature is higher. This again means that the testing environment isn't the same environment your home is going to experience constantly, even though the EER does accurately represent how much energy your AC equipment will use when your AC system is operated at the EER's test conditions. So, more imporantly is to note the factors that are unique to your specific environment that you live in. These are the variables that are unique to your home, your location, and your way of life, which neither of these efficiency ratings can account for, such as: What temperature do you keep your home set at in order to remain comfortable? What is the climate actually like where you live? Is your duct system design and equipment installtion sized and performed correctly? That is to say, the amount of heat that enters into your home, the amount of heat that is kept out of your home, and your air conditioner's ability to transfer heat in and out of your home, all vary depending on how your home is built as well as what kind of activities go on inside of your home. Heat factors unique to your home. What temperature do you set your thermostat at? Is your equipment and duct work installed correctly? How many electronics, lights, and other pieces of equipment that generate heat or humidity operate inside of your home? How often? What is your home's outter envelope and insulation like? What about the windows and doors? Alright, so let's go ahead and quickly describe the EER evaluation and testing procedure, it's also very similar to SEER. How EER Testing Takes Place (In a nutshell). EER testing takes place prior to when SEER testing takes place, and that's because in order to calculate SEER you have to perform several EER tests. This means EER testing is much simpler, and since it only evaluates a systems performance at a single set of indoor and outdoor conditions, only a single test is required to determine EER. The simulated outdoor environment, which contains the outdoor condensing unit, is maintained at 95°F with a relative humidity of 39% by an electric heater that matches the capacity of the cooling equipment. At this point, the EER is calculated, and we now know the EER of the equipment while it has operated at an 80 indoor temperature and 95 outdoor temperature at its maximum capacity. The test is concluded and the lab then proceeds to test for SEER. Using a EER rating to calculate energy cost. "So, how can I use EER to calculate energy costs?" So now that we are familiar with EER and the factors involved, let's go ahead and calculate energy costs based off of it. Remember, EER requires that equipment is tested at a single set of indoor and outdoor conditions on an hourly basis, and as indoor and outdoor conditions vary daily, we only use EER to calculate the cost of a specific set of conditions per hour - It doesn't reflect cost per day, per week, per month or per year. Our EER conditions are the same as the DOE's minimum test conditions at a 95°F outdoor temperature, and a 80°F indoor temperature. Assume our air conditioner being operated within these conditions is a 5 Ton air conditioner (60,000 BTU/H of Total Cooling Capacity). Assume the 5 ton air conditioner is rated at 15 EER. Assume the price of energy from the electric company is $0.09 cents per Kilowatt Hour worth of energy consumed. If a 5 ton air conditioner has an EER of 15, how much energy is it consuming per hour and how much does it cost?. Awesome! Now we know that our air conditioner uses 4,000 Watt Hours worth of energy in order to provide 60,000 BTUs of Cooling per hour, but how much does this cost? If we take a glance at the scenario defined above, we can see that the electric company charges us $0.09 cents per Kilowatt Hour worth of energy we use, but the EER formula requires that we work energy units of Watt Hours worth of energy consumption. So, immediately we run into a problem - Electric companies dont bill us based on Watt Hours, they bill us based on Kilowatt Hours, so we need to convert our Watt Hours worth of energy consumption into Kilowatt Hours worth of energy consumption. Great! So as it turns out, running our 15 EER air conditioner in a 95°F Outdoor Temperature and a 80°F Indoor Temperature for 1 Hour ends up costing us $0.36 Cents per hour! Nice. So this is exactly how we should use EER calculations when we compare equipment side by side. Remember, as well as SEER, EER are only for comparison purposes, and it's also a fairly straight-forward efficiency rating that is only concerned with an Energy In versus Energy Out ratio when conditions are kept at 95°F Outdoors and a 80°F Indoors. But knowing this little method about an air conditioner your interested in purchasing can be a helpful tool when your considering making a new purchase and not sure which product to buy. Remember, just about every thing that you can think of going on inside of your home contributes to AC energy consumption. There are literally so many factors involved with heat entering your home, or heat being created within your home, that we just don't have the time to sit down and calculate them all! And no matter what, don't always just assume that because an efficiency rating for a piece of equipment is highest, and you end up purchasing this new AC equipment based off the calculations you performed, that your going to be paying the electric company the exact price that your calculations determine - There are just too many variables to account for! EER is determined in a laboratory setting, within an artificial and simulated indoor and outdoor environment, not within your actual home's indoor and outdoor environment. EER is based off a set of conditions AC equipment operates within per hour. 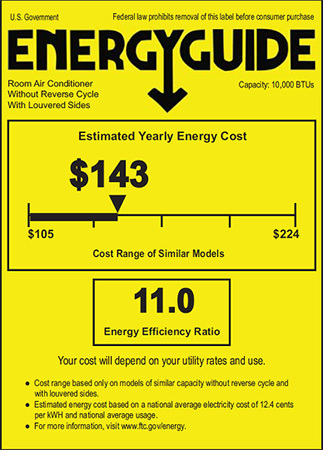 Manufacturers that are having their equipment's EER ratio determined supply 3 pieces of equipment that are all used to calculate the EER rating as a collective package, including: an Outdoor Condensing Unit, a Furnace, and an Indoor Evaporator Coil, all 3 of which are all tested at once and used to calculate a EER. This means: If you purchase a new 15 EER outdoor condensing unit, and plug it into your existing furnace or evaporator coil that you purchased 10 years ago, you no longer have a 15 EER condensing unit - It's a packaged deal! An EER is a useful tool for estimating and comparing how equipment operates per hour when it's hot outside.